Fully equipped picnic backpack with coffee service for two features classy white accents. The set includes: Stainless steel vacuum flask (24 ox), double walled insulated coffee mugs with caps, 9" melamine plates, stainless steel flatware, acrylic wine glasses, napkins, hardwood cutting board, cheese knife, wood salt and pepper shakers with no spill tops and a combination corkscrew. 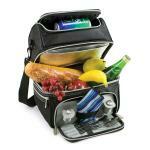 Roomy cooler compartment is Thermal Shield Insulated with removable leak proof lining. Convenient detachable wine/drink holder. This unique picnic pack is constructed of rugged 600D polycanvas. Designed and Assembled in the USA. Lifetime Warranty. 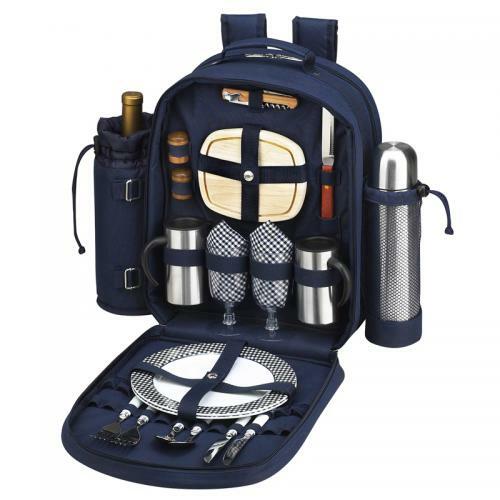 Cooler compartment with removable heat welded leak-proof liner keeps food at the perfect temperature for hours - an insulated wine holder and a vacuum flask are attached to the sides of backpack. "Thanks for offering PAYPAL. That's what made me choose your organization over the many others. I am a retired computer analyst and do all of my shopping via the internet and PAYPAL. The only stores I drive to (shop at) are the grocery, pharmacy and gas station. The internet and PAYPAL is much easier, faster and SAFER." For the high price, the contents of the backpack are cheaply made.